Maddie Bayer (1999-2007) is a forever seven-year-old girl who loved to smile, sing, and dance. Her father, Bob Bayer, is a regular volunteer with "Friends" and treasures the many memories of their outings to Disney productions and Muny shows that Friends provided for them. "Friends of Kids with Cancer does not forget the families of children who have passed on," Bob said. They have continued to be a part of our life even after Maddie left us, and I knew I wanted to stay connected and help other kids in treatment just like my daughter." Maddie's Wish is a special fund designated to send families to musical productions. 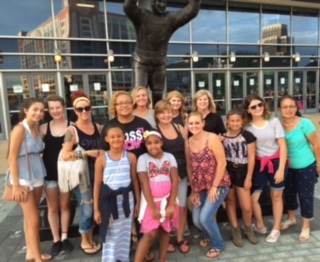 Since 2011, Maddie's Wish has sent over 180 families to live shows and performances! 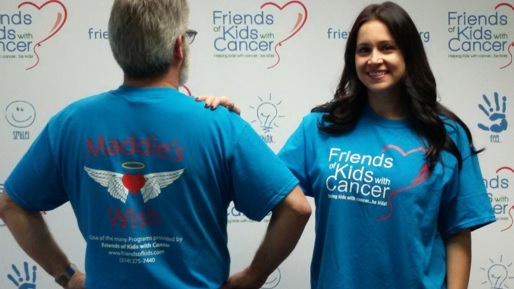 Support Maddie's Wish Fund by purchasing a T-Shirt. Mailing Address Street Apt, floor, suite, etc.